I made these Caramel Apple Truffles as part of a sponsored post for Musselman’s Apple Butter. We had another gorgeous fall weekend here in Minnesota. On Saturday, the whole family raked leaves in our yard. In the evening we had an autumn get-together with friends. We visited, carved pumpkins and ate all sorts of delicious fall treats from popcorn balls and caramel apples to pumpkin pie and hot apple cider. Of course I wanted to bring something fun to share with everyone and decided to make Caramel Apple Truffles. Everyone raved about the truffles and there weren’t any left to bring home once the evening was over. What was my secret ingredient? Musselman’s Apple Butter! Musselman’s Apple Butter is so much more than a spread. It can be used in savory dishes from baked beans to BBQ wings and in sweet dishes from cheesecake to cinnamon buns. 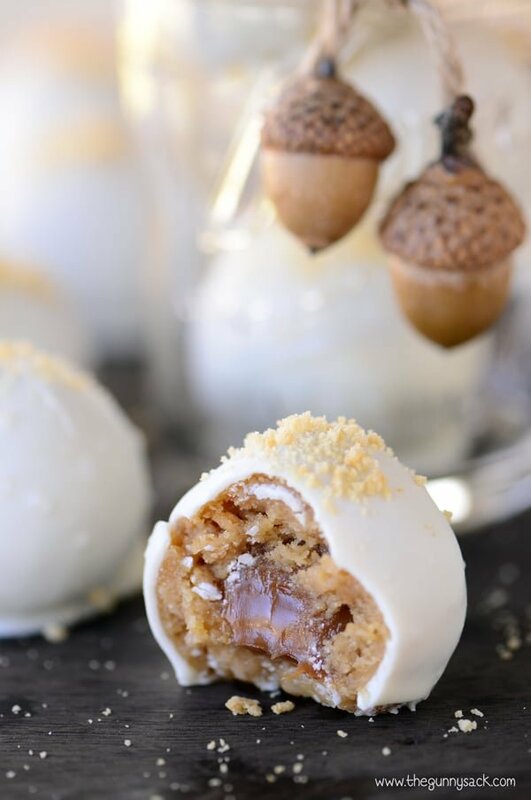 For this caramel apple truffle recipe you will need Mussleman’s Apple Butter, cream cheese, soft cream caramels and vanilla sandwich cookies. Finely crush 33 vanilla sandwich cookies, remove 1/4 cup and set aside for garnish. I used my food processor, but a food chopper or even a rolling pin would work as well. 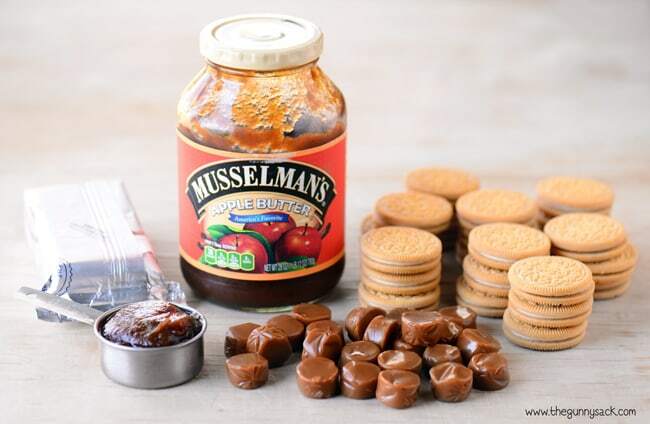 Mix in four ounces of softened cream cheese and 1/4 cup of Musselman’s Apple Butter until well combined. 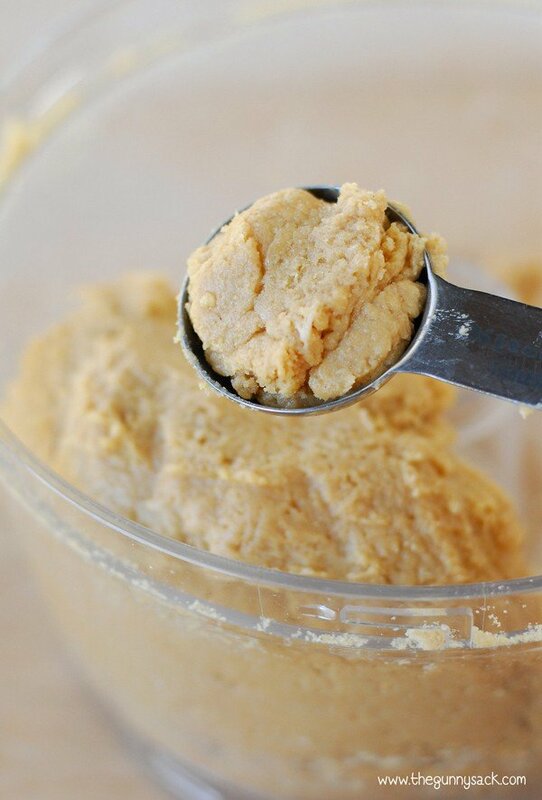 This can be done in a food processor, a mixer or can even be stirred by hand. 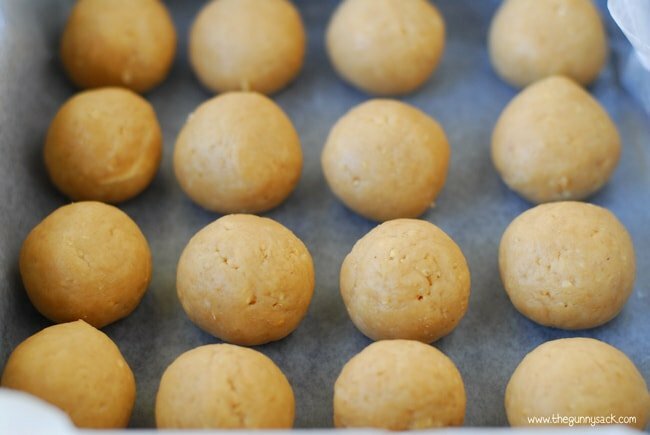 Scoop out about one tablespoon of the mixture, add a caramel and roll the mixture around the caramel to form a ball. Place the balls on a pan that is covered with waxed paper. Put the rolled truffles in the freezer for about 15 minutes (or in the fridge for 30 minutes) until firm. Melt vanilla almond bark in the microwave according to the directions on the package. Use a fork to dip the truffles in the almond bark. Gently tap off the excess almond bark. If the almond bark in the bowl starts to harden, reheat it in the microwave at 10 second intervals. Use a small, thin knife or a toothpick to carefully push the truffles off of the fork and onto a silicon mat or a piece of parchment paper. Sprinkle with crushed vanilla sandwich cookies immediately after placing the truffles on the mat, before the almond bark hardens. 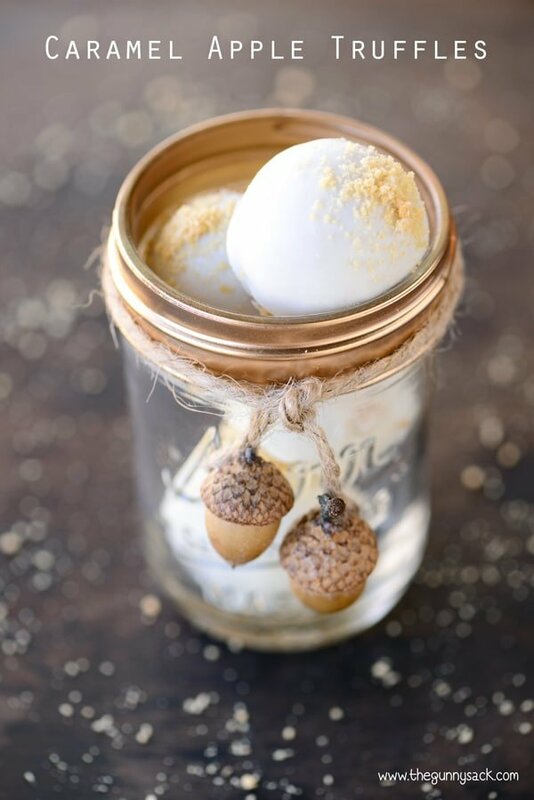 This will add some texture to the truffles and help to hide any imperfections. Put the truffles in the fridge and allow the almond bark to harden completely. Store the truffles in the fridge, but remove them about 30 minutes before serving to allow the caramel in the center to soften. 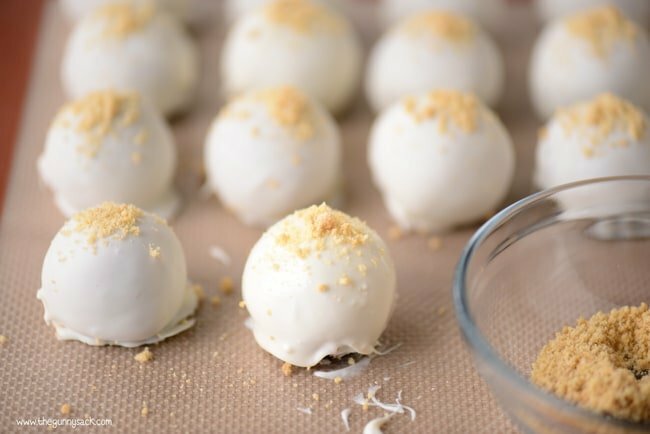 Regular sandwich cookie and cream cheese truffles are good, but when you add Musselman’s Apple Butter and stuff the truffles with caramel, they move to a whole new level of delicious. Everyone at the fall get-together loved them! Finely crush 30 vanilla sandwich cookies, remove 1/4 cup and set aside for garnish. 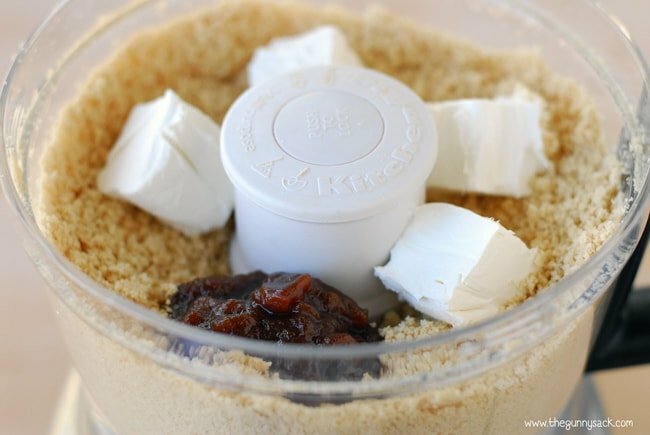 Mix in four ounces of softened cream cheese and 1/4 cup of Musselman’s Apple Butter until well combined. 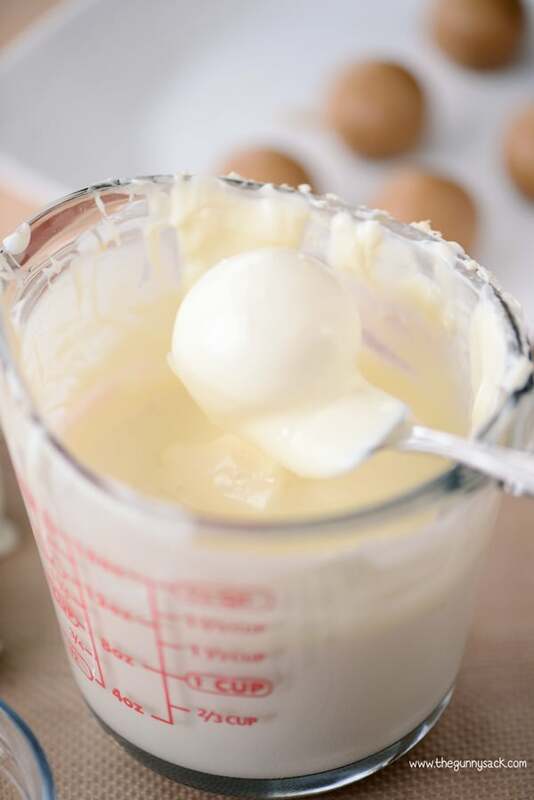 Scoop about one tablespoon of the mixture, add a caramel and roll the mixture around the caramel to form a ball. Melt vanilla almond bark (or candy coating) in the microwave according to the directions on the package. Set the dipped truffles on a silicon mat or a piece of parchment paper. Sprinkle with crushed vanilla sandwich cookies immediately after placing the truffles on the mat, before the almond bark hardens. Store the truffles in the fridge, but remove them about 30 minutes before serving to allow the caramels in the center to soften. How far in advance can these be made? Thanks! I wouldn’t make them more than a week in advance. Be sure to store them in a sealed container in the fridge. Best of luck! I’m sorry, I am not sure what a cream caramel is? I know this is a Musselman’s project, but can you supply a brand name for the caramels so I can figure out what to buy for this recipe? Hello, can I substitute the cookies for a vanilla cake? We don’t have vanilla almond bark in Australia – would it be best just to use white chocolate? When you crush the cookies do you use the cookie and the middle filling? What kind of caramels do you use? Would regular Kraft ones work, or do they need to be softer? I used Lancaster Soft Cremes. The regular Kraft ones might work, but they are bigger in size and more chewy. Happy Baking! Yes, I would store these in the fridge. They will hold up for a few hours outside the fridge, so it depends on how long the gifts would be out of the fridge. Best of luck! Spiced Apple Cake looks really good to me. I love Apple Butter. I’m going to make an apple spice cake. you posted. That looks so so so so amazing. I would make Apple Butter Pancakes! I would make the Apple Butter Hotcakes! Yummy! Apple Butter Cheesecake.. omg.. that sounds absolutely amazing! I would make an apple butter cake. I would like to make Banana Apple Streusel Muffins. Lord have mercy….those truffles look amazing. I want to make those….hopefully they will look and taste as good as yours. I also add Musselmans to chicken and ribs….yum. 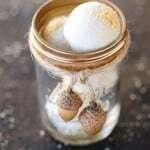 I wanna try the truffles! I never think to make anything with apple butter…I usually just like it on my toast. 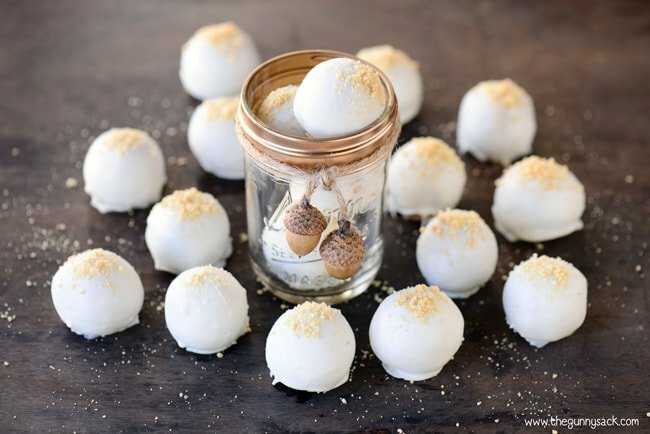 But these truffles look delicious…I may need to make those! I think apple cinnamon muffins would be great with some apple butter stirred in the batter. I’d spread apple butter on the baked muffins, too!